I'm fairly pathetic when it comes to developing character names, especially for my fantasy stories. I like to use names that sound fantasy-ish, but yet are not some sort of random agglomeration of letters. Unfortunately, this is precisely what many "fantasy" name generators do. 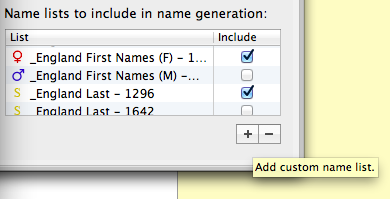 My writing software of choice, Scrivener, has a built-in name generator. (Mac friends: you can find it under "Edit-->Writing Tools.") It comes pre-populated with a number of name lists, but they're all fairly modern. It usually takes me a while to find one that works for me. However, I just noticed this morning that you can add your own lists to the generator! This is all well and good, of course, except for my first point above: I'm not good at developing names. So, I did what any self-respecting person does, and went to the Google, where I found author DL Thurston's website. He has so kindly put together a number of name lists for purposes of import to Scrivener, including several lists of names from the time of yore in England and the 19th century in the US. I followed his instructions, and within minutes, I had found the perfect names for Characters A, B, and X. Thanks, DL! Newer PostScrivener 3 is here!